I left Golden, British Colombia and I drove towards Montana, my destination for the evening was Glacier National Park. I arrived around 5pm, which is plenty of daylight, but tight to expect to find a campsite, for such a popular park in the summer. The attendant at the West Glacier entrance informed me that no sites were available and the entry fee was $30 for 7 days, and no option to pay a daily rate. 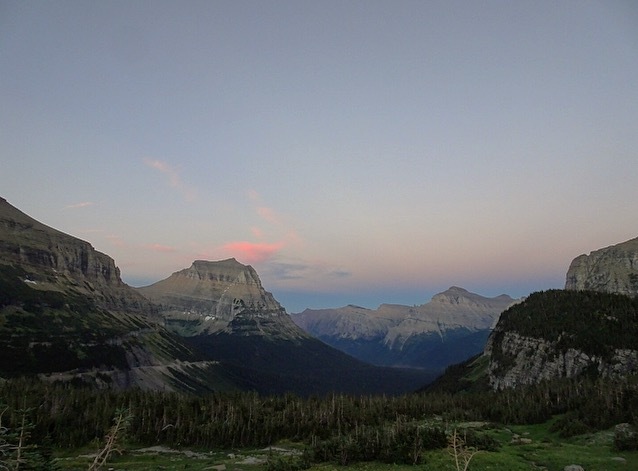 Whether I spent the night in the park or not, wasn’t on my mind as much as how I was dead-set on driving one of the most scenic drives in America, Going-To-The-Sun Road. It is a 52 mile road that goes from one side of the park to the other and from what I read about it, I was willing to pass over $30 to just drive across the park. I drove in and immediately slowed down, and feel into a trance of the sights and smells. I had no rush to get through this park, and I wanted to leisurely enjoy it at my own pace, now that I had pasted the velvet ropes and gained a renegade entry. My first stop was Lake McDonald where I took my first fresh water swim of this trip. It was a hot day and I floated in the clear water flanked by mountains with large pebbles under my feet. I moved forward and stopped every time I felt the urge, and that was a lot. By 10pm, I had only made it half way through the 52 mile road. When I know I am just passing through or taking a scenic drive, I know that the best times are at sunrise and sunset. I considered the lady being nice enough to let me in, under the guise that I would just drive straight through. It was dark now, and my options were to drive the second half of the road in the dark and exit Glacier to find a place to park and sleep, or maybe, I could just slink back into a side road, and park at a picnic area. So I did. And in the morning, I drove the rest of Going-To-The-Sun Road in the light of the sunrise.